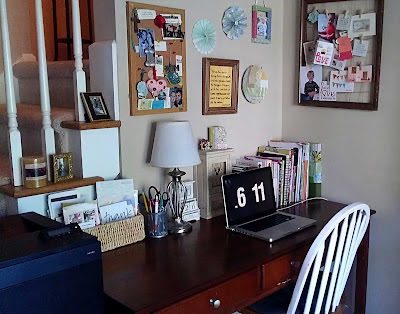 The Creative Place: workspaces: my own. I am incredibly fortunate to have my own work space -- this area is supposed to be for a formal dining area (note the chandelier), but we eat in our kitchen and decided we didn't need an extra eating space :) We have a very open floor plan on our downstairs level, I love that it's open and airy. So, to start - my desk area and two printers are to the left in the room. 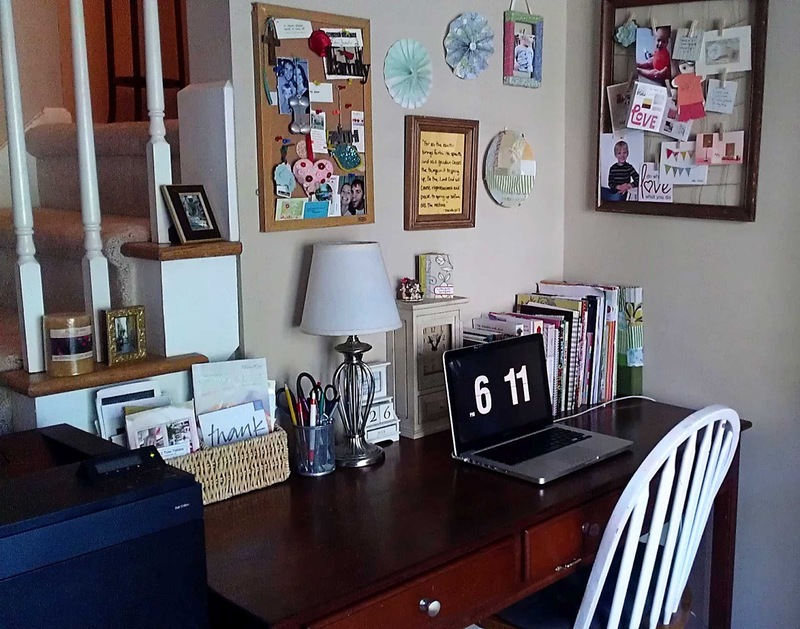 I do a lot of blogging, emailing, and shop upkeep at this desk :) I have a lot of my fave books stowed here, as well as a bulletin board and frame and twine board to put pictures and bits and pieces. 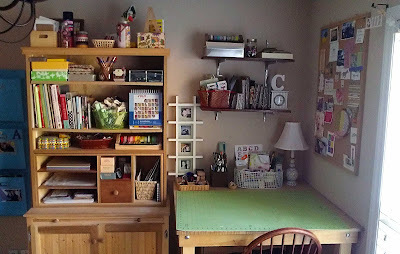 I love my actual work area - the large table where I can stand (or sit) and cut paper, put together journals, paper packs, etc. 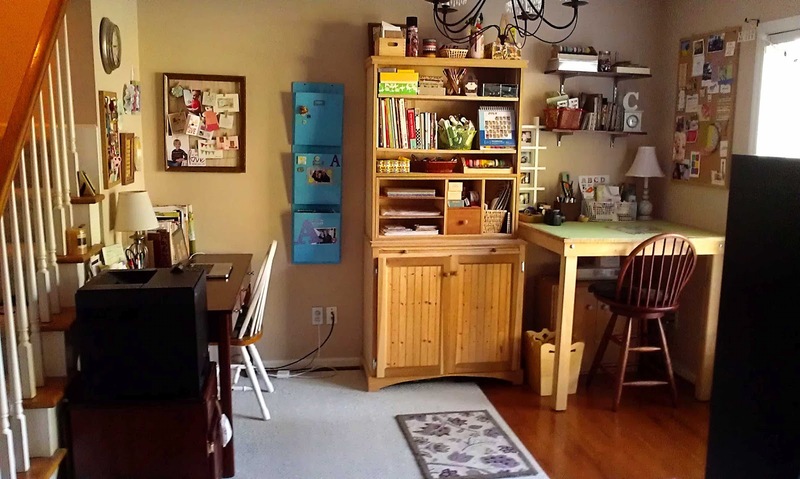 My dad is an amazing woodworker and custom-made the table and the craft cabinet (and my desk above... and the trashcan in the picture below ;)). I drew up several sketches with measurements, sent them to him, and he created them. I love them. So neat to be working on furniture my dad made :) Right now they are unfinished wood. One day I might paint them. Maybe. 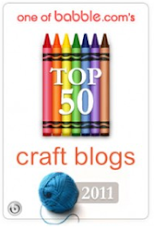 :) Go here to see more pictures of the craft cabinet when we first installed it. On the craft cabinet shelves I keep a bunch of odds and ends - craft punches, cello bags for packaging, washi tape, alpha stickers, envelopes, shipping supplies (return address labels, packing tape, "Please do not bend" stamp). In the cabinet below are storage boxes of paper scraps for scrap paper packs, as well as other materials that I don't use often (batting, contact paper, glue gun, etc). On the craft table I have a huge cutting mat, and there are a couple little baskets to store materials I use a lot - adhesive, thread, paper clips, stamps and a stamp pad. I also have a container holding pens, pencils, metal rulers, hole punches and my rotary cutter. Above the table I store my minis, more washi tape, buttons and some other odds and ends. I love the huge bulletin board on the adjacent wall. 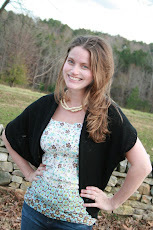 Easy to access to put pictures and other pieces of inspiration. I store my sewing machine underneath the table on a small cabinet. 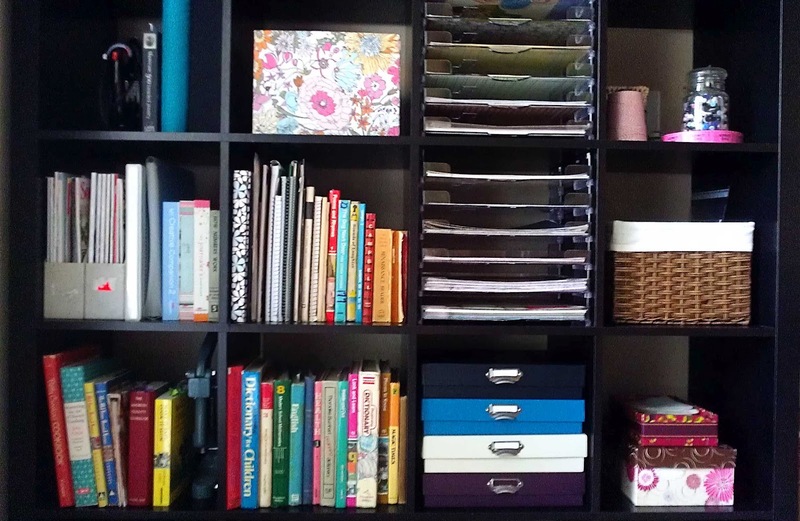 The cabinet holds things such as paint, stamps, colored pencils, etc. I recently added this fabulous Expedit Bookcase from Ikea and my, oh, my I LOVE it. It's huge and a perfect way to store a lot of different things. 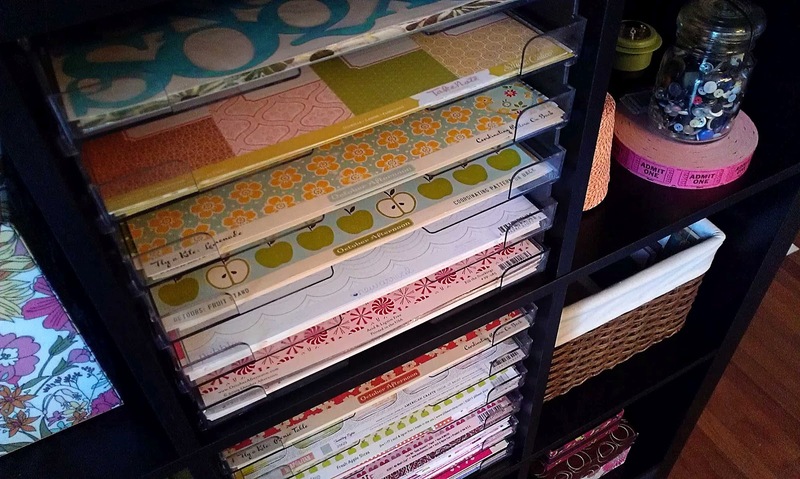 I purchased some 12x12 paper tray holders from AC Moore to store all of my paper - which is organized into how they will be used - mostly to make journals- Autumn, Christmas, Baby and Random. 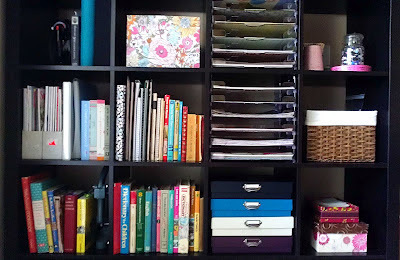 I have several containers that hold different things - more shipping supplies (envelopes, cardboard, bubble wrap), more paper scraps, labels, envelopes and other ingredients for art journals. And all of my fabric is over top of the bookcase. I find your workspace adorable!!! 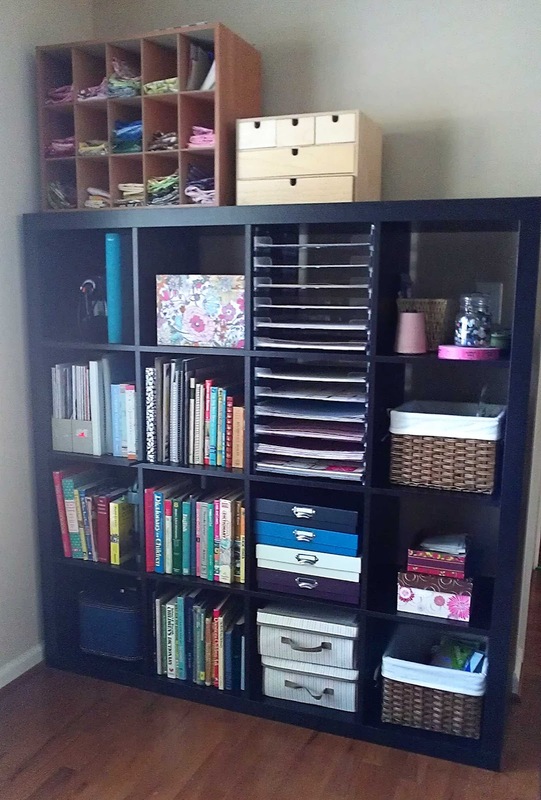 I love all you storage solutions. 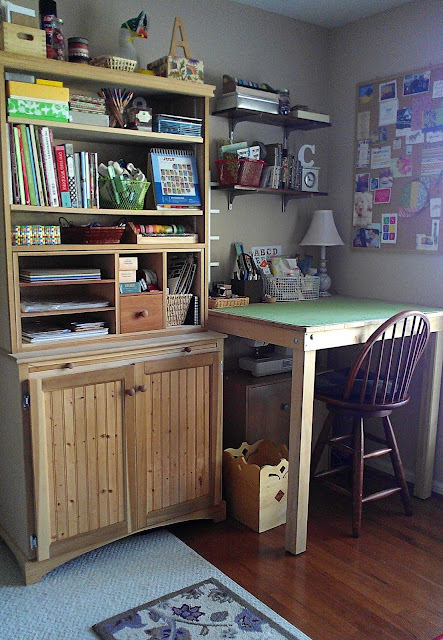 The craft hutch is to die for, let me know when your dad is taking orders :) And of course the Expedit is so great. 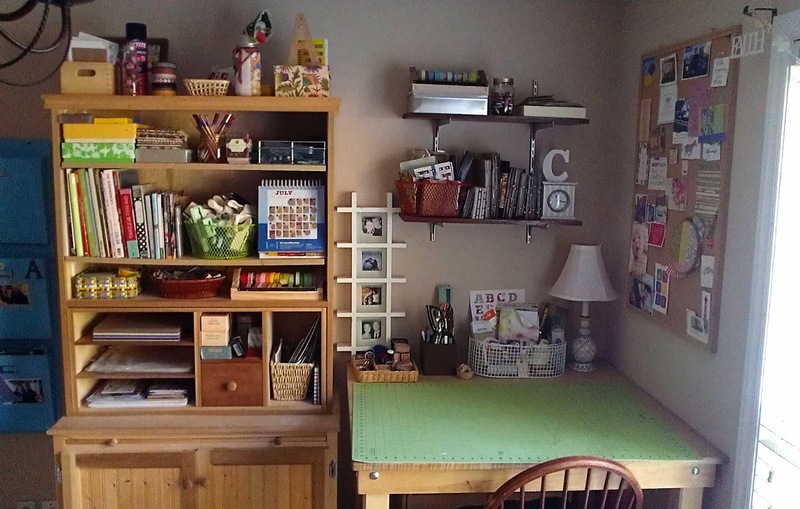 Beautiful space, thanks for sharing. Love it! 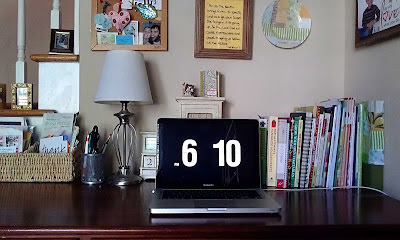 What app did you use for the clock on your laptop? I love big numbers.. lol.. 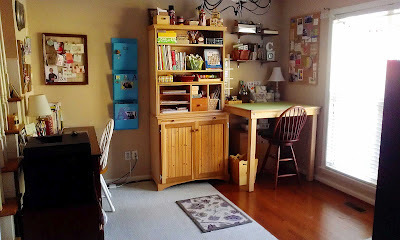 I love your workspace and all your great supplies, it makes it fun to work when everything is organized and has it's place to go back to when you're done creating. Very inspiring space! I love the pieces your dad made, so beautiful. Love your workspace. I'm moving soon and I'm planning on having a very clean, very inspiring workspace!